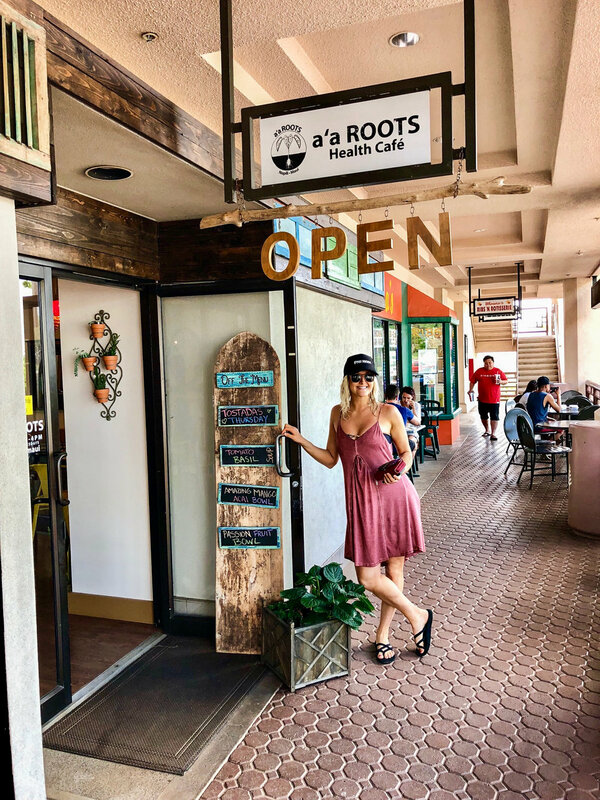 Located in Napili, this adorable cafe offers great vibes and an amazing variety of food. They are also one of the all vegan cafes on the island, which I was so stoked about! It makes things so easy and less stressful for those who are plant-based, you don't have to ask a bunch of questions or worry about some piece of meat slipping into your food. 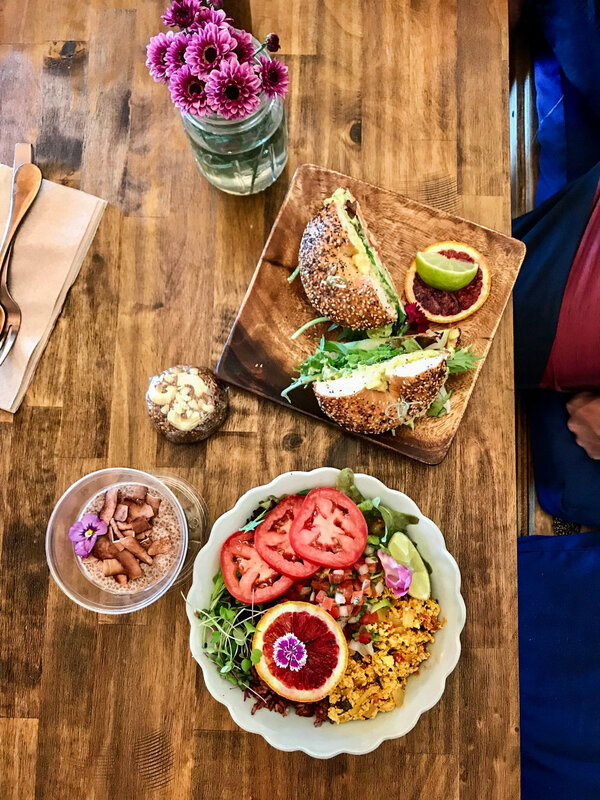 They offer everything from savory bowls, bagels, made to order juices and smoothies, acai bowls, toast with toppings, and fresh salads. They even have a few grab and go tasty treats like raw cheesecakes! The food was brought out to us so beautifully presented, I hardly wanted to touch it. It tasted amazing- I got a tofu scramble bowl and my boyfriend had an avocado bagel with tons of veggies. I couldn't help but want to try everything, I was in vegan food heaven! So I got some of their chocolate chia pudding and it was fantastic. The people were also so nice and welcoming, all around great vibes and great food. My favorite little coffee shop in central Kihei. 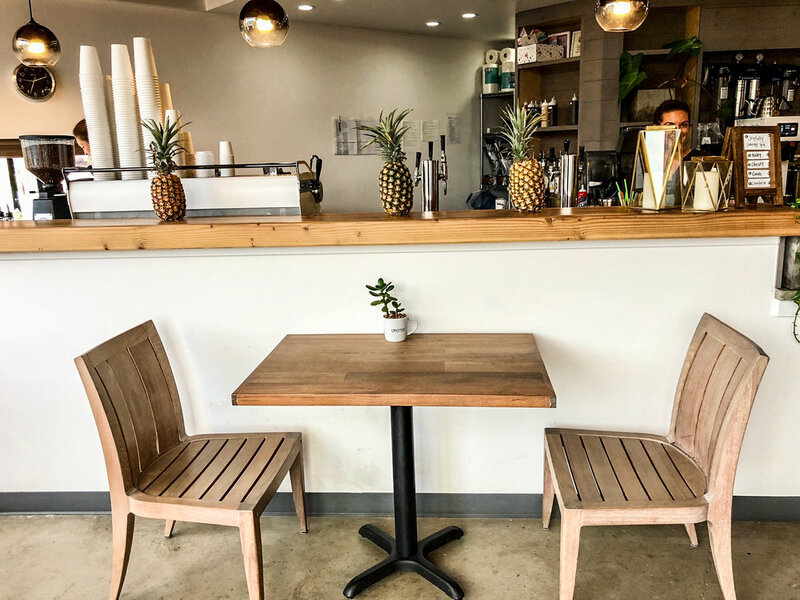 They use 100% Maui coffees that are locally roasted and take the time to fine-tune their coffee so they can offer the best quality for their customers. Everything from their indoor decor, friendly staff, and smooth tasting coffee is nothing shy of excellent. We came here almost every day during our trip because we love it so much. Since I have been more into Matcha lately I ordered that most of the time and it was always consistent. They also offer some amazing vegan raw bars in a variety of flavors made by my good friend Kati (@getrealdesserts) that go great with a coffee in hand! Wow Wow Lemonade is known for their refreshing lemonade's that are hand-crafted using locally sourced fruits for the freshest ingredients as well as supporting Hawaiian farmers. All of their drinks are unpasteurized to ensure the highest amount of nutrition and live enzymes as possible. I also love the fact that they have the option to purchase a mason jar which you can bring back for your next visit and receive a discount! This minimizes waste and is all around better for the planet. You get to take home a fancy mason jar (with a refreshing cold lemonade in hand) AND do your part for mother earth! Wow Wow Lemonade is also one of my go-to places for an amazing acai bowl, they have some of the best. They also offer a great variety of smoothies and nut milks. You can seriously taste the freshness in every sip! They are located in Kihei and are a must-try. Feeling a little hungry after that long flight? 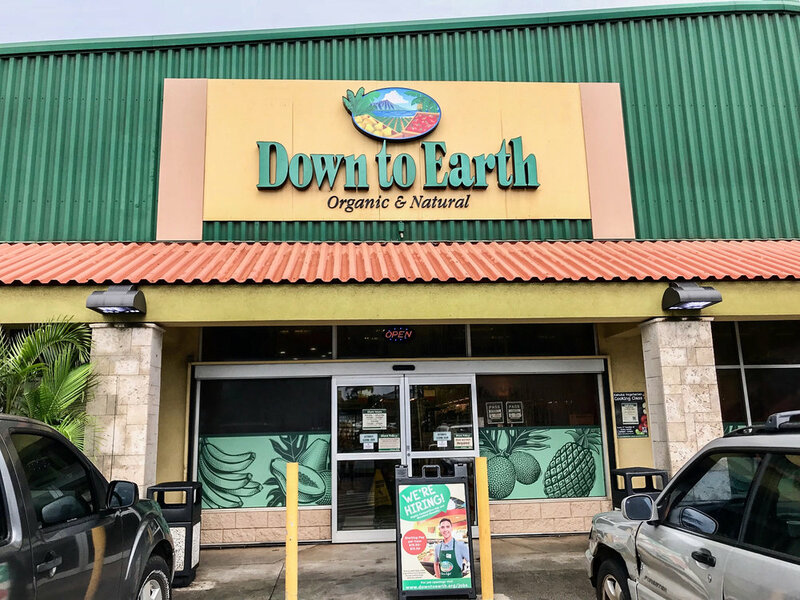 Down to Earth is an awesome spot to grab a bite to eat! 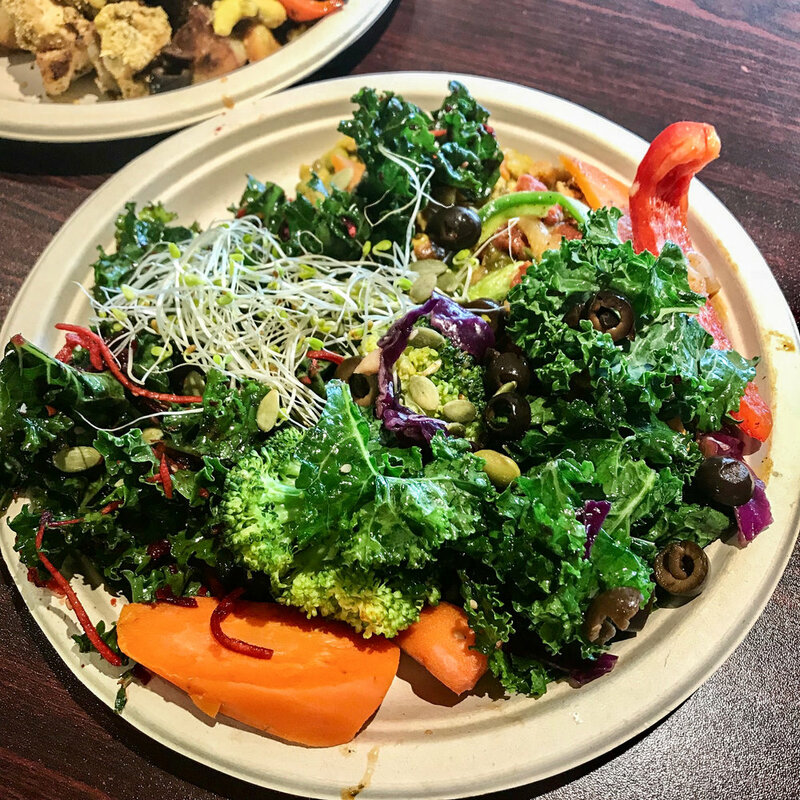 They are located in Kahului not far from the airport and offer a variety of food options including a hot bar, salad bar, smoothie & juice bar, coffee bar, sandwiches, wraps and burgers! Even better, they are 100% vegetarian and are more vegan friendly then not! Not only do they have great food to pick up either on the go or to eat there, but they are a full grocery store with tons of healthy options. When I lived in Kahului this was my go to place. Mmm mmm mmm! Feeling the heat of the sun and want something light and fresh? Fork and Salad has the biggest and best salads that are made using all local produce! They support their Hawaiian farms and use the freshest ingredients. They have a variety of specialty salads and sandwiches to choose from, or you can build your own. They also have soups, juices, coffee and locally brewed kombucha. Their idea is to offer easy, healthy, convenient and affordable food while still offering farm-to-table cuisine. This concept is so exciting to me because a lot of the time eating at a farm-to-table restaurant can cost a pretty penny. You shouldn't have to pay a fortune to fuel your body with nourishing food that is naturally found in nature, right? They are located in Kihei and I highly suggest you check them out! I believe this little health food grocery store is the only one located in all of Kihei, which was a life savior when I lived there. They are super small but carry all the essentials! If you want to buy some fresh produce to cook dinner at home or in your condo, they got you. They also have a great hot bar and salad bar with both breakfast & lunch. I especially love their smoothie options- this bright pink one is made with pitaya (also known as dragon fruit) and is naturally this color, how cool is that? 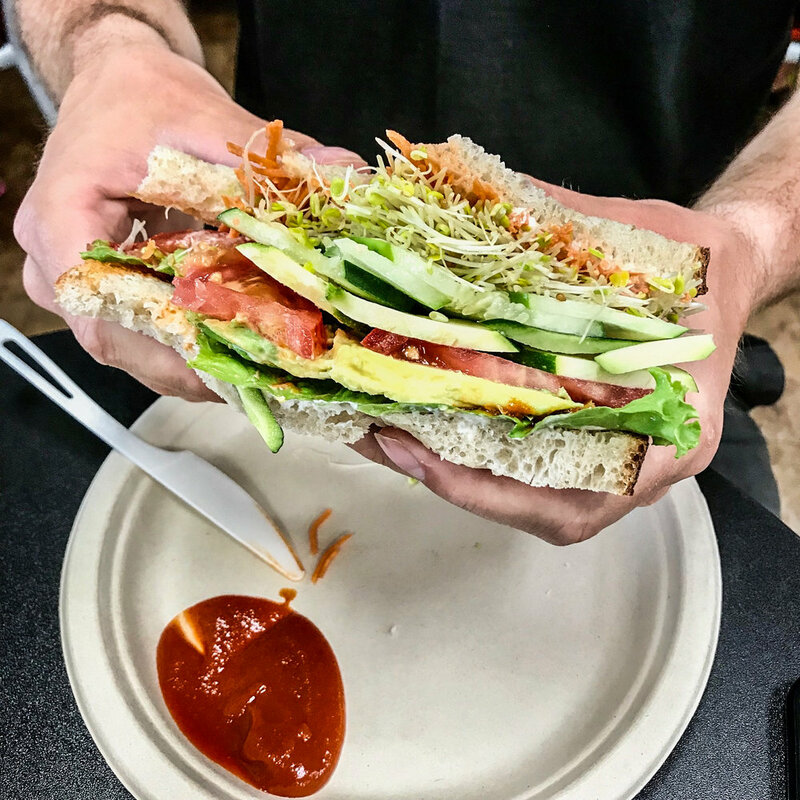 They serve a variety of sandwiches, vegan burgers and wraps as well as fresh pressed juices and coffee. So go get something healthy for lunch and walk across the street to have a picnic on the beach! This little whole in the wall nestled up country in little Haiku is one of my favorite local spots to enjoy some fresh brewed kombucha (plus all the vegan love that they put into their food menu). They brew all of their kombucha themselves and have a variety of fun flavors to try like blackberry sage and ginger lime. They change up their flavors often so you always have an opportunity to try something new. I always feel a little giddy and fuzzy inside walking away from this place; kombucha has that effect on you ;) Not only is this bubbly fermented drink super tasty but also it contains so many health benefits! Feel free to read more about that on their website. Another great hidden gem. I highly suggest one morning getting up early for a run on Baldwin beach, jump in the ocean at little beach, and then go to Paia Bowls for a great way to fuel your body for the day. It is right past Paia Bay hidden behind a clothing store. They have yummy acai bowls, oatmeal, smoothies and juices. Not only is their food great but they also have a great outdoor seating area that gives you all the jungle vibes! You can’t get more local then The Farmacy! With two locations now, one in Wailuku and one upcountry in Kula, there is no excuse not to check them out. 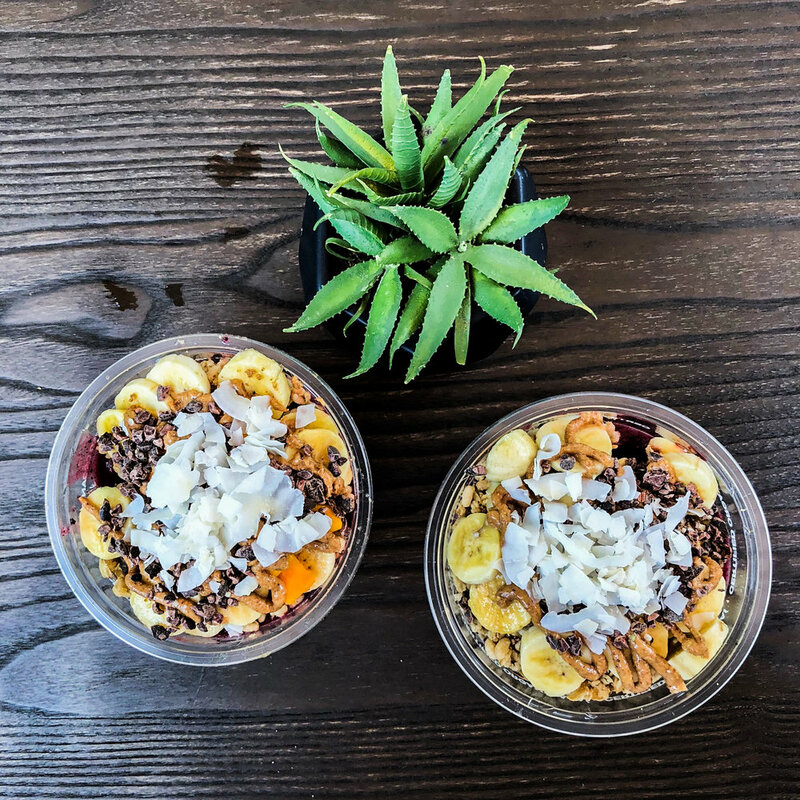 They probably have the best acai bowls on the island, no joke. You can get a small, medium, or one bigger then your head, literally! They have one that is especially tasty because of the poi on the bottom. Poi is fermented and ground up taro root, making it super good for you. It is native to the Hawaiian Islands so it’s always a fun one to try to get a little taste of the Hawaiian culture. They also have a variety of fresh tropical fruits to put on top, such as papaya, mango and lilikoi. The Farmacy also offers a great lunch menu- vegan burgers, lettuce wraps, power bowls, soups, salads, and sandwiches. They also have fresh squeezed lemonades, juices and smoothies. When I lived in Wailuku it was hard not to eat here at least 3 times a week!